I recently started experimenting with Selective Color adjustment layers. Normally I rely on Curves and Levels for brightness and contrast adjustments, but in reading about and experimenting with Selective Color, it definitely has some advantages, especially when adjusting the light and dark tones in combination with luminosity masks. 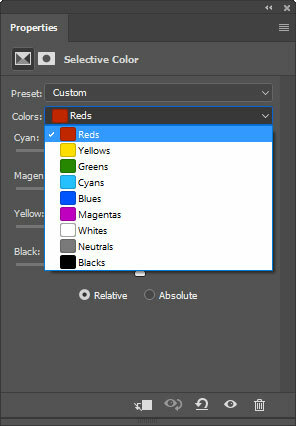 The Selective Color Properties panel has a drop-down menu of colors. The panel’s sliders are labeled with CYMK colors, but they actually allow hue, saturation, and brightness to be independently adjusted for any item chosen from the list once you understand how this panel works. For this tutorial, the “Whites” and the “Blacks” will be of primary interest. 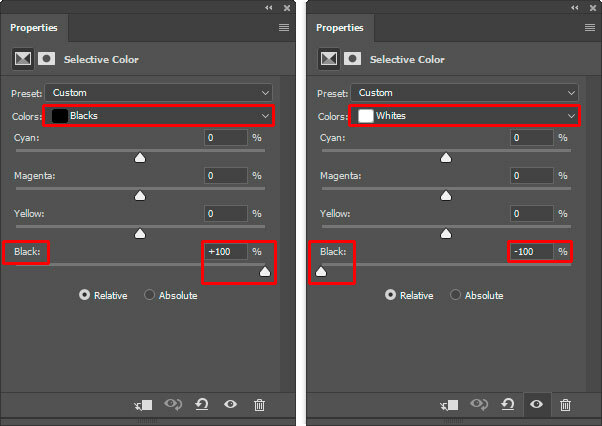 Using the “Whites” and “Blacks” to adjust image brightness (and to some degree contrast) has the advantage of avoiding the saturation and color shifts associated with using Curves and Levels for this purpose. With Curves and Levels adjustments, saturation and color changes become mixed in with brightness/contrast changes, and it’s hard to separate them out. The best way to see this is with a strong “S-Curve” equivalent adjustment using different types of adjustment layers. The S-Curve adjustment increases contrast−the lights get lighter and the darks get darker. In the Selective Color adjustment, the “Whites” correspond to the light values in the image and “Blacks” correspond to dark values. In order to create an “S-Curve” equivalent, the “Whites” from the drop-down menue need to be less black and the “Blacks” need to be more black. The screen shots below show the two Selective Color adjustments necessary to produce a strong “S-Curve” equivalent adjustment. 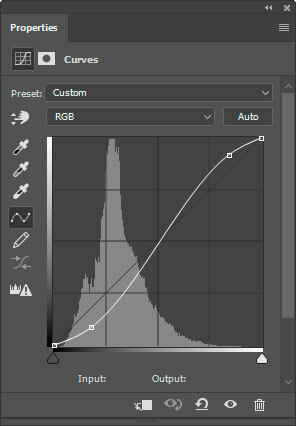 With Curves and Levels adjustment layers, it’s common practice to change the blending mode to Luminosity to counteract the saturation shift, and the image below, which shows the Curves adjustment layer set to Luminosity blend mode, shows that this does indeed help. However, there are still color shifts, and the rollover (which shows the Selective Color adjustment) shows that they are still present. It’s most obvious in the blues of the lower clouds, but also somewhat visible in the reds and yellows. So when it comes to avoiding color and saturation shifts, Selective Color has an advantage even after changing the blending mode of the Curves adjustment to Luminosity. For the adjustment to this image, I ended up using only the full-on “Blacks” Selective Color adjustment that darkened the “Blacks” as much as possible. The light tones in the image really didn’t need any lightening so the “Whites” were not changed. The result of this initial adjustment is shown below. This adjustment is definitely too aggressive for my taste, but that’s intentional. It provides a good starting point for using luminosity masks. A luminosity mask can be used to filter this adjustment only to those tones that really need it. In doing so, much of the exaggerated adjustment will be concealed by the mask. The end result will be a more balanced adjustment that blends in perfectly to the rest of the image. In this case, I experimented with Darks, Midtones, and Zone masks and found that a Zone 4 mask added as a layer mask did a nice job of creating the desired effect. The result after adding the layer mask is shown below. The rollover shows the adjustment without the luminosity mask in order to see how seamlessly the mask blended the adjustment into the image. 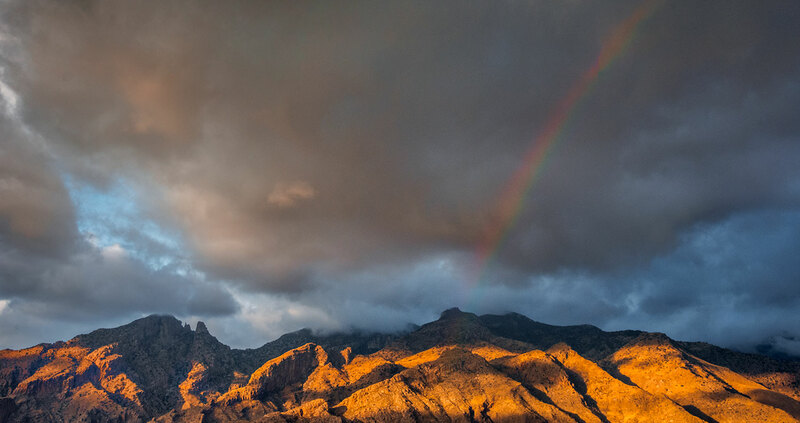 The ease at which a preset luminosity mask finished this adjustment points out another possible advantage of using the Selective Color adjustment. And that is that it works well to create an initial adjustment to a broad, but limited, range of tones (“Whites” or “Blacks”), which can then be quickly and accurately refined with a luminosity mask. It’s almost like having a targeted double-masking technique where a strong targeted adjustment is first applied, and this can then be fine-tuned and focused using the narrower tonal range of a luminosity mask. SUMMARY−Adjustments to brightness (and to some degree to contrast) using a Selective Color adjustment layer helps avoid the saturation and color shifts associated with Curves and Levels. Additionally, Selective Color adjustments allow a two-step adjustment process where the initial, somewhat extreme adjustment can be easily modified by applying a more targeted luminosity mask to the adjustment layer to better control which tones in the image are affected. FINAL NOTE: Every image is different and there’s likely no single workflow with Selective Color and luminosity masks that will work the same repeatedly. I’m finding that using Selective Color to adjust the “Whites” and “Blacks” provides expected and desirable results once I find the correct luminosity mask as demonstrated in the video. It’s always possible to return to the Properties panel to tweak to the initial Selective Color adjustment if necessary.